Hello readers! I just got back from a well-needed vacation to the midwest. Detached myself from the computer and the phone (well, as much as possible) thus explaining my absence from here for a few weeks. Well, I’m back. OK, partially. Still dealing with a bit of a migraine headache and some fatigue for the last few days but trying to push through as much as possible. I have TONS of new photos and reviews from my trip to share with you all! Today, I’m going to be sharing this recipe for a make-at-home version of those sugar-roasted nuts you can get at the ballpark. You know the ones I mean. Even if the stand is on the third baseline, you can smell it from the first base side. Those sugar-roasted nuts. The little nuggets of goodness that come in the papery cone holders. Now, based on my personal preference, I would tweak the measurements of the ingredients if I were to do this again. I would definitely lower the amount of ground ginger and cloves in it because I didn’t get as much of the cinnamon taste as I love. But, it’s a great start. Thanks to The Gingerbread Blog for posting the original version! This is one of those recipes that doesn’t need too much attention. Plus, it gives you a great reason to bring out the crockpot during the summer months. These sugared nuts would be great additions on salads, as toppings on sundaes, or just munching on. First, preheat the slow cooker to high for 15 minutes. I have a standard size crockpot that’s about 5 to 6 quarts in capacity. Once the crockpot has been heated in advance, pour in the nuts and the melted butter. Next, sprinkle the powdered sugar over the nut/butter mixture. Stir thoroughly so that it coats evenly. Cover the crockpot and cook on high for 15 minutes. Then, reduce the heat to low and remove the lid. Check on the nuts every 20 minutes or so for a quick stir. Leave uncovered and on low for 2 to 3 hours, or until the nuts have a crisp glaze. It took about 2 hours and 15 minutes for mine to be ready. Transfer to a bowl to cool. 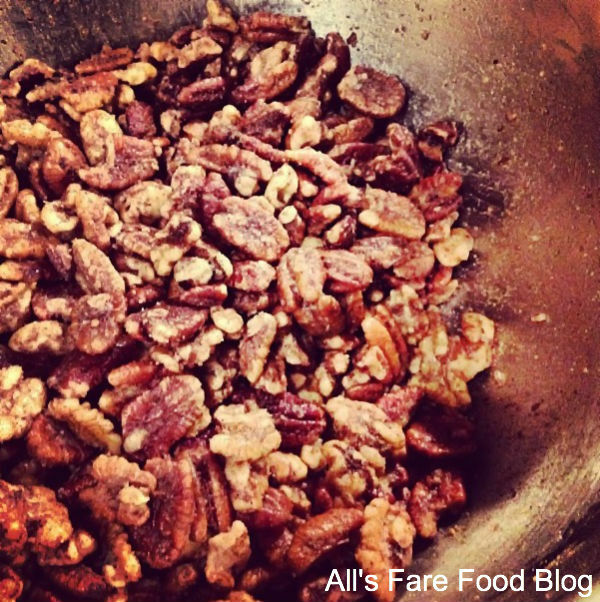 This entry was posted in Cuisine - Desserts, Recipes and tagged baseball, cashews, crockpot, desserts, nuts, pecans, recipe, slow cooker, sundaes, toppings by Christina. Bookmark the permalink. I’m so bummed that baseball season is drawing to a close… But I’ll save this recipe for next April! Could be good for football season too…yay Packers! True… It’ll be the reason I start watching more football: the food!